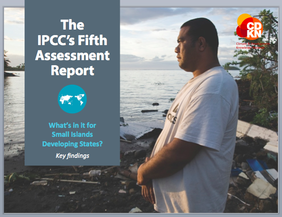 This report presents key findings from the IPCC’s Fifth Assessment Report (AR5) for Small Island Developing States (SIDS). It extracts SIDS-specific data, trends and analysis directly from AR5, summarising it in a short volume to make it accessible to all audiences, and highlights key opportunities to achieve adaptation, mitigation and development. The IPCC has produced the most comprehensive assessment of climate change ever. The Fifth Assessment Report (AR5), is the work of 830 expert authors from 85 countries and its first three volumes already stretch to 5,000+ pages. 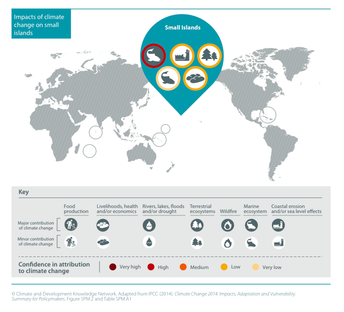 Now, the Climate and Development Knowledge Network and the Overseas Development Institute have released a succinct guide to the assessment for decision-makers in Small Island Developing States. Alongside the What’s in it for Small Island Developing States report, CDKN presents a series of infographics, freely available for training, educational and reporting purposes, to encourage understanding of the report worldwide. These images are free to use by journalists under an exclusive license in conjunction with articles on the contents of What's in it for Small Island Developing States. These infographics illustrate the data presented by What's in it for Small Island Developing States and can be used by anyone for training and discussion purposes. To encourage a dialogue on What's in it for Small Island Developing States, these image slideshows can be used by anyone for training and discussion purposes. The infographics and presentations offered as part of one of our initiatives are intended to be used for educational purposes and to generate discussion around the reports. The images presented as part of one of our initiatives are free to use by journalists or educators in connection with the activities of the initiative. However, they are licensed only for this purpose, so to monitor access to the images, we require that interested parties submit their details to be granted permission to download the images. Please take a moment to read the terms and conditions.